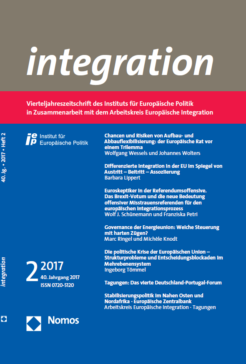 In the new issue of integration, Wolfgang Wessels and Johannes Wolters depict the flexibilization of integration policy in the EU along the dimension integrative vs. disintegrative flexibilization and analyze the opportunities and risks related to this development. Barbara Lippert examines the ambivalences of differentiated integration as well as the resulting consequences for political cohesion in the EU. Wolf J. Schünemann and Franziska Petri identify various phases in the history of EU referendums, develop distinct criteria for the new type of offensive referendums of no-confidence and compare the latest EU-related referendums along these criteria before giving a short outlook on potential contagion effects of the new referendum type. Marc Ringel and Michèle Knodt analyse the legislative package “Clean Energy for All Europeans” concerning the method of open coordination on the one side and elements of a more binding nature on the other side. They also discuss in how far the proposal is suited to deliver a tangible contribution to Europe’s energy and climate goals for 2030. Ingeborg Tömmel focuses on the intergovernmental institutions’ lacking ability to exercise power in relevant policy areas and the resulting impacts for the EU’s capacity to act. Besides the report on the fourth Germany-Portugal-Forum, the ‘Arbeitskreis Europäische Integration’ reports on conferences about the EU stabilization policy in the Middle East and North Africa as well as about the European Central Bank. Since the beginning of the process of European integration, policy-makers and scholars alike keep facing an ever-resurging question: Which states take part in which kind of expansion and extension of the common (West-)European construction? Along the dimension integrative and disintegrative flexibilization this article depicts the flexibilization of integration policy in the EU and analyzes the opportunities and risks related to this development. Building on this analysis, the authors point out a trilemma for the Heads of State or Government when dealing with integrative and disintegrative flexibilization and define criteria and conditions for a sensible combination of the two types. In the context of the concept and practice of exit, accession and association, the ambivalences of differentiated integration (DI) in the EU become evident. The political appeal of DI lies in its multifunctionality concerning the upgrading or downgrading of the acquis, and thus the ambivalence with regard to integration politics. In contrast to this internal flexibility, the EU demonstrates a rigid policy regarding the admission of new members and tolerates exceptions on an interim basis only. The urge for more differentiation inside the Union could, however, open new ways to yet unknown partial memberships. The DI of today is contrasted with the model of a “flexible union” which bears many risks. Whether DI facilitates, impedes or destroys political cohesion, depends on whether the mutual trust between member states suffices and whether acceptable burden sharing can be established across all policy areas. The so-called Brexit referendum of June 2016 constitutes not only the beginning, but also the temporary point of culmination of a new phase in the problematic relationship between European integration and direct democracy. Whereas during the 1990s and 2000s several EU-related referendums led to considerable irritations in the integration process, today we are dealing with a new type of referendums we call ‘offensive referendums of no-confidence’. We find that the avoidance of referendums during the last couple of years by political elites did not lead to a silencing of Eurosceptics, but gave rise to claims for national referendums against the EU instead. To underline this argument, this paper first identifies three phases in the history of EU referendums. We then develop three distinct criteria for the new type of offensive referendums of no-confidence and compare the latest four EU-related referendums along these criteria. In conclusion, the article reflects on the potential contagion effect of this new referendum type and evaluates to what extent its use could pose a threat to the European integration project. Governance of the Energy Union: soft control with hard features? The legislative package “Clean Energy for All Europeans” tabled by the European Commission aims at structuring the framework for climate and energy policies by 2030. Key element of the package is the energy governance regulation which focuses on a better coordination of national energy policies. Despite the recourse to the soft method of open coordination, the regulation contains elements of a more binding nature, potentially leading to the point of intervening in the national energy mix of member states. In contrast, the draft regulation bundles planning and reporting obligations to increase their political effectiveness and economic efficiency. With this proposal, the Commission walks a fine line: Member states will only accept the binding elements of the proposal once the associated benefits in terms of political effectiveness and economic efficiency prevail. Our contribution analyses these criteria and discusses in how far the proposal is suited to deliver a tangible contribution to Europe’s energy and climate goals for 2030. Faced with a series of fundamental crises, the EU actually appears significantly constrained in its capacity to act. The causes for this situation are seen in recent transformations within the Union, overlapping and reinforcing each other. The core thesis of this contribution is that the powers transferred to the intergovernmental institutions in relevant policy areas could not be transformed into increased capacities to act, due to structural constraints and changing circumstances induced or reinforced by the crises. The article elaborates on the factors underlying these developments and highlights the resulting impacts based on selected empirical examples. Finally, it discusses possible ways out from the impasse.